Up for sale is a NOISE ISOLATION HA-FX65M GUMY PLUS HEADPHONE WITH REMOTE MICROPHONE. 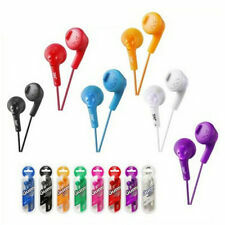 Title: JVC HAFX5B GUMY Plus Earbuds Black. JVC HAFX5B GUMY Plus Earbuds Black. The new Gumy Plus features a soft rubber body for a comfortable fit and good noise isolation, which ensures a better listening experience. Soft Rubber Body for Comfortable Fit and Good Noise Isolation. Sensitivity: 103 dB / 1mW. Frequency Response: 10-20,000 Hz. 2x JVC HA-FX65M GUMY PLUS HEADPHONES WITH REMOTE+ MICROPHONE. JVC HA-FX65M BLUE GUMY PLUS HEADPHONES WITH REMOTE+ MICROPHONE. JVC HA-FX9BT-A GUMY WIRELESS BLUETOOTH EARBUD, BLUE COLOR. Trending at $8.86eBay determines this price through a machine learned model of the product's sale prices within the last 90 days. NEW In Open Box, Tested and Inspected in Excellent Working Condition. Enjoy high-quality sound with these JVC Gumy wireless headphones. JVC HA-FX9BT Gumy. Magnet Type: Neodymium. Enables simple wireless pairing with your Bluetooth-enabled device. Expert Service. Unbeatable Price. JVC HA-FX7M-B BLACK Gumy In-ear Headphone. Complete with Remote & Microphone. Model Number: HAFX7GB. Manufacturer Part Number HAFX7GB. Product Model HAFX7GB. Manufacturer: JVC(R). Manufacturer JVC(R). 1-button remote/microphone with mute switch for gaming with voice chat. Product Information. Neodymium 13.5mm drivers&ltbr> Freq resp: 16Hz-20kHz&ltbr> Imp: 16ohm &ltbr> Sensitivity: 108dB/1mW&ltbr> Oval form & soft rubber body&ltbr> 3.3ft cord&ltbr> Black&ltbr>. Personal Hygien Products. 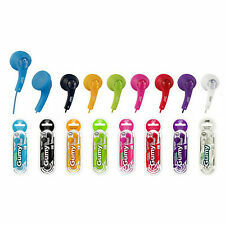 Gumy Sport Stereo Headphones. The one-button mic/remote is compatible with iOS, Android and Blackberry devices. Earpiece admits ambient noise for safety. Secure & comfortable fitting with nozzle-fit earpiece. Noise Isolation Stereo Headphones. Frequency Response: 10Hz - 20,000Hz. Factory Sealed. Sensitivity 103dB / 1mW.